Poor, poor men and their lack of shoe options - it's sooo good to be a GIRL! 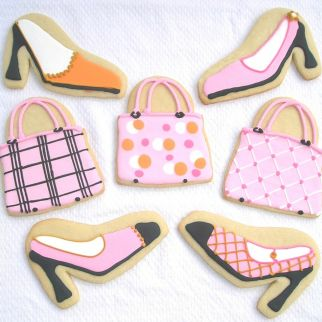 These darling purse cookie and shoes cookies are fresh baked and decorated to order for girl's parties of all ages. Your child's birthday party or theme Sweet 16 party guests will love these delicious cookies. 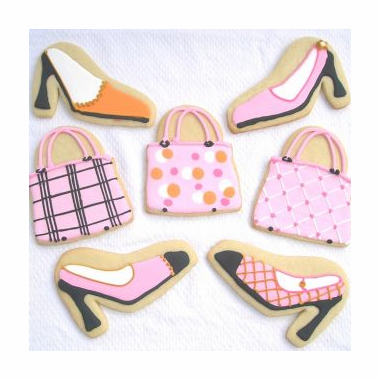 Handbags: 4.5" x 4" High Heels: 5.5" x 3.5"
Please fill out the information above for the number of each cookie design you would like in your order. Please let us know if you have color preferences - pastels or brights, and your color choices. Would you like your cookies personalized? Let us know - we would love to accomodate you! The price includes individual cellophane bagging with matching ribbon.